I recently read an article that states “according to science, having a sister just might make you a better human being.” Well, I couldn’t agree more and don’t need a scientific study to confirm it! Having a sister, whether she’s a sorority sister, a sister of the heart, or a sister by birth, positively impacts your life. I should know. I grew up with two wonderful sisters. And gained even more sisters through my membership in Alpha Delta Pi. My college sorority years will always be special. Working together as chapter sisters, learning and practicing our ritual, being a Big Sister to a new member, serving as an officer, attending socials and formals, long hours of recruitment and initiation ceremonies, and simply spending time together were shared experiences that helped us grow as young women and friends. College days end, but our letters and our sorority friendships last forever. After college, I moved to a new city and career and joined the Nashville Alumnae Association. Those alumnae sisters immediately welcomed me and made me feel at home. Being part of this group of sisters fostered some wonderful friendships and influenced me to be involved as an ADPi volunteer. Some sorority sisters become lifelong friends. Some are like family. And sometimes, sisters actually are family! I came home to Alpha Delta Pi at Delta Theta Chapter, Valdosta State University. During fall recruitment of my senior year, my sister Christie pledged. I was so happy to see her run through the doors of our chapter room with bid card in hand. Our year together in chapter was fun, and helping conduct her initiation ceremony is one of my fondest memories. Our youngest sister, Jonna, joined the chapter when Christie was a junior. For nine years in a row, there was a Bledsoe sister (or two) in Delta Theta chapter. Now, fast forward to the fall of 2009. 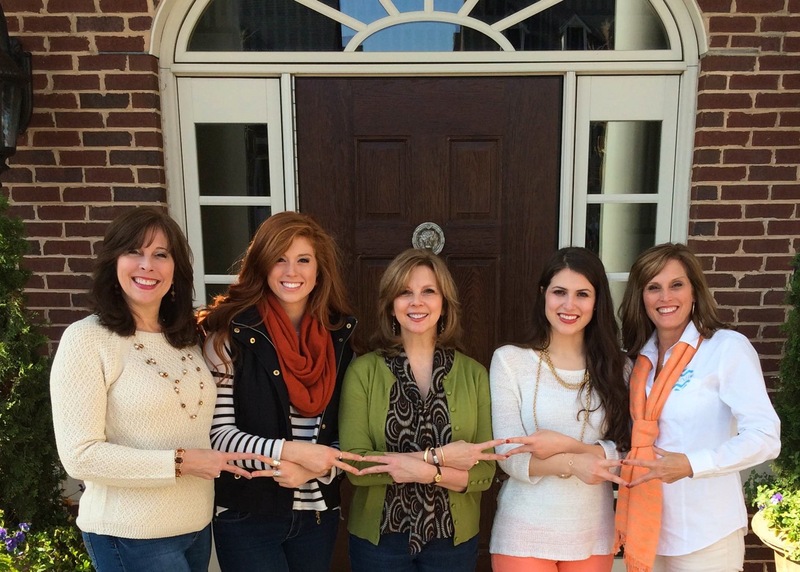 Jonna’s daughter, Hilary, pledged Alpha Kappa Chapter at the University of Tennessee-Knoxville. We surprised Hilary by attending her Initiation. I knew this would be a special evening, but I wasn’t fully prepared for the wave of emotion I felt when my sister pinned her daughter. Those of you who’ve attended the initiation ceremony of a family member know exactly what I mean. It’s so meaningful, yet difficult to describe. Hilary loved her college sorority experience. 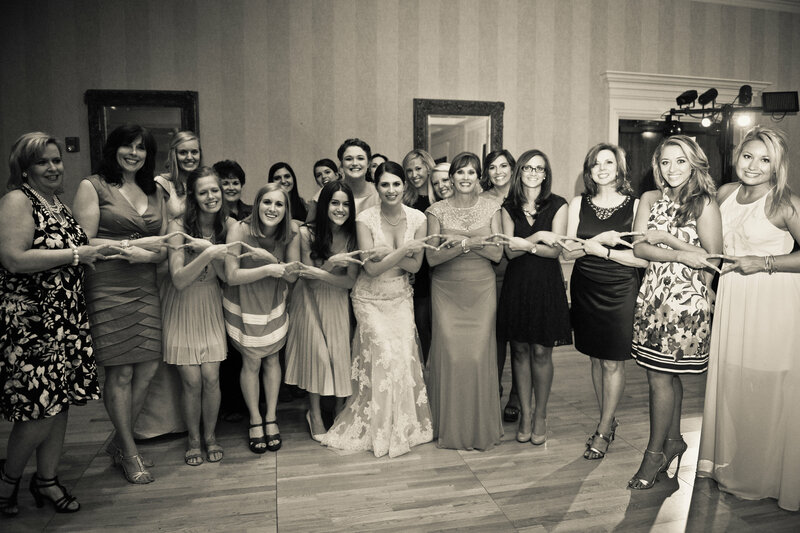 When she married in June of 2014, several ADPi chapter sisters, friends and family members were there to celebrate the bride and groom. In the fall of 2014, Christie’s daughter, Sarah Catherine, pledged Alpha Kappa Chapter. 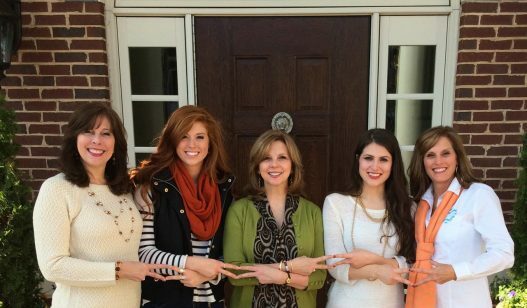 All four ADPi family members attended Initiation (no surprise there!) to welcome her into our sisterhood. Our family circle was complete. One of my favorite photos is of the five of us on the front steps of the Alpha Delta Pi house the morning after initiation. Our first family diamond photo! Last year, Sarah Catherine and I both attended Convention. She represented Alpha Kappa as their chapter president, and I attended in my volunteer role. The last night of Convention we sat together at the Closing Awards Banquet. The highlight of the evening was witnessing her joy and excitement when Alpha Kappa was announced as a Golden Lion Award recipient. For me, it was a proud aunt and ADPi sister moment as I watched Sarah Catherine accept the award on behalf of her chapter. This is a special memory I’ll always treasure. It’s evident that wearing the diamond badge has become a tradition in my family. In addition to my sisters and nieces, I have two Alpha Delta Pi cousins. Andrea pledged at Eastern Kentucky University and Claire is currently in Beta Psi chapter at the University of Kentucky. There are seven ADPi’s in my family. You can be certain that a diamond picture is taken at our annual family gathering. Alpha Delta Pi is woven into the fabric of my life. Being part of this sisterhood has made me a better person. I treasure the friendships, skills gained and memories made through my sorority membership. Most of all, sharing ADPi with my siblings, nieces, and cousins adds extra special meaning to my sorority experience.